I came across a green June beetle (Cotinis nitida, family Scarabaeidae) larva (grub) last Thursday slowly slinking across a driveway. 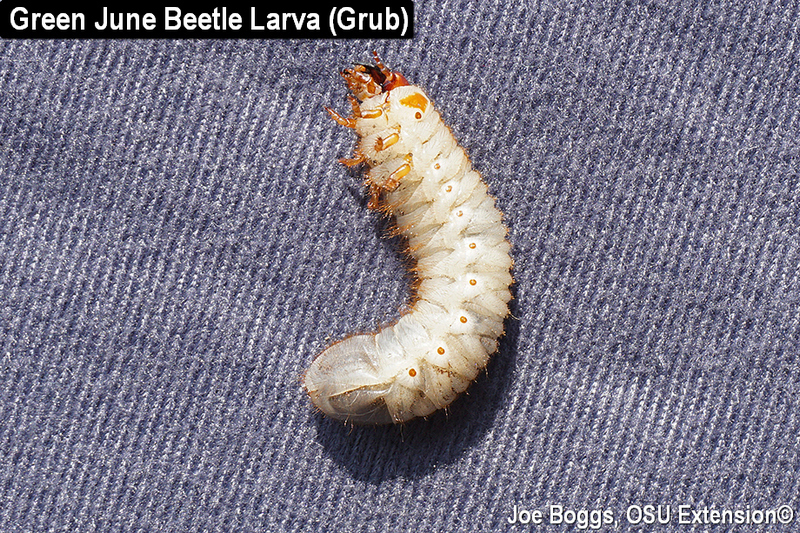 This is one of the largest and strangest white grubs you'll ever see in Ohio. First, the mature grubs are huge measuring well over 1" in length. They look like white grubs on steroids. Second, the grubs practice a highly unusual mode of movement: they crawl along on their backs in an undulating motion! You can see this bizarre upside-down grub-crawl in a video I posted by clicking on "Grub Crawl" under "More Information" below. The grubs rolling motion cause them to superficially resemble caterpillars. In fact, when I first saw this grub creeping along, I thought it was a caterpillar. Since green June beetles crawl without the aid of their legs, you'll notice their legs are smaller than those of other white grubs, particularly in relation to the size of their bodies. The other unusual thing about these grubs is that unlike other white grubs affecting turfgrass, green June beetle grubs create vertical burrows 10-12" into the soil, and they normally remain closely associated with these burrows. They primarily feed on decaying organic matter such as thatch and much of their damage to turfgrass is associated with their burrowing and tunneling behavior. However, they have been known to feed on turfgrass producing damage in irregular patches. The grubs venture out of their burrows in late-evening or during the night to feed or to go on an upside-down crawl-about in search of more food. They may also be driven out by heavy rains to appear in large numbers meandering across driveways and sidewalks or dropping into swimming pools. Although they can damage turfgrass, they're primarily considered a nuisance pest. The same is true of the large, metallic green adult beetles. Although they may occasionally feed on tree leaves as skeletonizers, or they may be found on ripening fruit, the beetles are most notorious for emerging en masse to terrorize backyard gardeners, golfers, sunbathers, small pets, etc., as they cruise about 2 – 3 ft. above the ground. Their large size coupled with an audible "buzzing" sound and low-level flight plan may induce mild panic in individuals unfamiliar with this insect. Like their grubs, the beetles have great entertainment value. There appears to be a strong association between high organic and high populations of this beetle. So, control efforts should focus on reducing organic matter, particularly thatch, beneath infested lawns. For example, thatch reduction using core aeration to hasten decay by infusing oxygen into the organic matter may eventually make infested lawns less attractive as grub development sites by these buzz-bombing beetles. The grubs are also food for the larvae of the blue-winged wasp (Scolia dubia). This wasp is a common visitor to late-season blooms such as those produced by goldenrod (Solidago spp.). Providing a good late-season nectar source, such as planting late-bloomers in landscapes, can help draw in this parasitoid wasp. On a final note, I posted a BYGL Alert about this wasp just a few weeks ago (see Blue-Winged Wasps Cruising Lawns, September 17, 2018) and incorrectly stated that it is "a parasitoid of white grubs with a particular affinity for green June beetle (Continus nitida) and Japanese beetle (Popillia japonica) grubs." This is only half-right. As turfgrass entomologist and (thankfully!) BYGL fact-checker, Dan Potter (Entomology, University of Kentucky) pointed out, there is no scientific evidence this wasp attacks Japanese beetle grubs. However, it's well established that the wasp is the nemesis of green June beetle grubs.